Long Island Spirits, Inc. announced today the availability of its new family of spirits called Sorbetta. The Sorbetta family is extremely rare in quality and are uniquely the first potato based Liqueur’s crafted in the United States. The Sorbetta’s achieve a farm to bottle freshness in their taste profile by using only individually hand peeled and macerated fresh fruits combined with pure cane sugar that is patiently crafted in small micro-batches from the spirits of LiV Vodka. 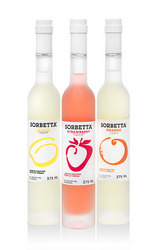 The Sorbetta Family of Lemon, Orange and Strawberry is distributed by Winebow Inc. and is currently now available for sale in finer retailers and drinking establishments in the following states New York, New Jersey, Washington DC, Pennsylvania, Connecticut, Massachusetts and Illinois. Although technically classified a Liqueur, Sorbetta is in itself a new kind of spirit category as it is crafted to fill a gap that exists for mixologist’s between the typical over sugared syrupy Liqueurs and the countless synthetic tasting flavored vodka’s on the market today. The Sorbetta’s are currently available in 375ML sizes for about $22. “Responding to the burgeoning cocktail culture movement, Sorbetta is crafted with all natural purity of fruit flavor in mind” extolled Richard Stabile, Founder of Long Island Spirits, “each flavor manages to capture that fresh picked taste experience”. “Sorbetta is a welcome addition to a category that is crowded with economy brands that are too sweet and artificially flavored” applauded Dale DeGroff a.k.a. King of Cocktails, “Finally an American liqueur line that can compete with the French and Italians”. Lemon Sorbetta: The fragrance is pure, fresh and sultry; morning in an Italian lemon grove. There is an elegant silky feeling on the palate; with just the proper amount of sweetness that makes for an amazingly refreshing finish. Orange Sorbetta: A brilliant orange blossom nose. Delicious orange decadence that quickly fills the mouth with crisp, clean, zesty flavor. Extremely well balanced with an authentically fresh squeezed relaxing smooth finish. Strawberry Sorbetta: A remarkable bouquet that ignites all the senses with its clean, alluring and rich strawberry flavor. Pure vine ripened fruit shines through on the palate with an uncommonly regal finish. “Mixologists are increasingly seeking locally crafted, high quality artisanal spirits. The Sorbetta’s provide a remarkable fresh taste which allows them to create some truly unique new cocktails” added Scott Tallon, Spirits Director of Winebow. Preparation: Shake all the ingredients well and strain into a short Highball glass over ice. Garnish with strawberries and mint sprig. Preparation: Season and old-fashioned glass by coating the inside with 1/4 ounce Pimms #1 toss out the excess. Fill the glass 3/4 full of ice and pour in the Lillet and the Sorbetta Orange and stir. Garnish with half an orange wheel and serve with short straws. Preparation: Prepare a cocktail glass with a sugar frosted rim. Assemble the three spirits in a cocktail shaker with ice and shake well and strain into the prepared glass. Flame an orange peel over the top of the drink and drop the peel into to drink. 2 ounces fresh grapefruit juice. Preparation: Assemble all the ingredients in a cocktail shaker with ice and shake we’ll. Strain into a chilled cocktail glass and garnish with an orange or grapefruit zest or both. *Cinnamon Syrup: 1 cup pure water, 2 cups granulated sugar, 12 cinnamon sticks. Assemble all the ingredients in a sauce pan over medium heat and stir until the sugar is completely dissolved. Turn the heat down to simmer and simmer for 2 hours covered. Cool. Strain and bottle for use. NOTE: Cinnamon Syrup is available commercially but the homemade is so easy to make and so far superior to the commercial product I encourage you to prepare your own. NOTE: The punch is wonderful by itself , but as you will see from the drink below it is VERY mixable. Make a batch and tuck it away in the fridge and try with your favorite spirits. Preparation: Fill a wine goblet three quarters with ice cubes. Add the Aperol and then the punch primavera. Squeeze the lemon wedge into the drink and drop it in. Garnish with the mint sprig. Preparation: Fill a goblet 3/4 full with ice cubes. Add the Cointreau the and Sorbetta. Top with the Brut Rose sparkling wine and garnish with the strawberry and mint sprig. Winebow, Inc., http://www.winebow.com founded in 1980 by Leonardo LoCascio, is a major importer and distributor of fine wines and spirits from around the world. Winebow is headquartered in Montvale, New Jersey with additional distribution offices in New York, New York; Philadelphia, Pennsylvania; Washington, D.C.; Boston, Massachusetts; Illinois; and Connecticut.